In order to resume the ability to smile on ourselves, our vices and our everyday life and invite us to a break of lightness, the Association Pro Castello di Caneva proposes the fifth edition of the Caneva Ride Contest! Open to designers around the world. The theme of 2018 edition: "With the head in the clouds", a reflection on a way of being! Is it wrong to get lost in thought? what does it mean to be out of reality? at what height you have to be to look at things from above...to your narratives the verdict. The award was born to celebrate the memory of Toni Zampol, who for many years veiled the vices and virtues of Caneva and its inhabitants with his pencil. 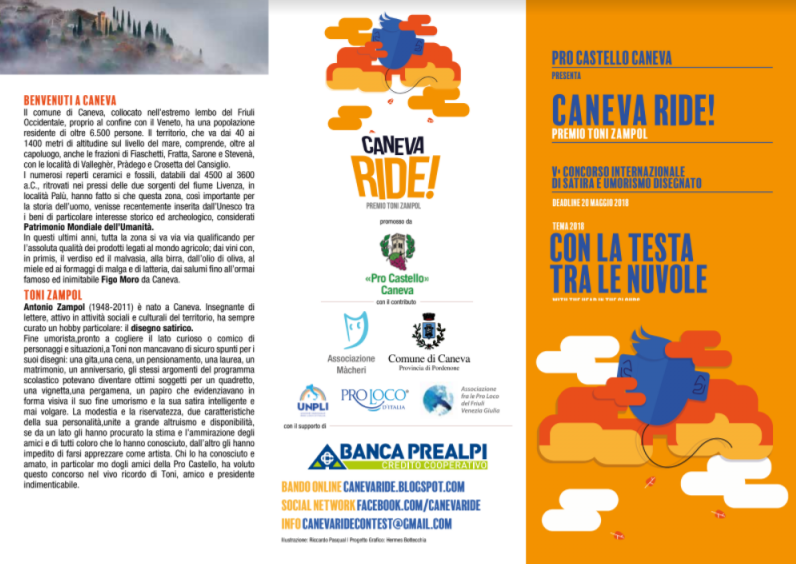 1 - THEME Pro Castello di Caneva promotes the international award Caneva Ride! (Caneva Laughs!) for humoristic sketches and satirical costume about the theme Con la testa tra le nuvole/With the head of the clouds. 2 - PARTICIPATION The award is open to all cartoonists of the world from 16 years old. Participants can apply individually or in groups (in case of several authors, the referent for all communications with the award’s promoters shall be indicated). 3 - TECHNIQUES Up to three unpublished works, realized by any technique, color or black and white, which haven’t been awarded in other prizes. The the maximum format shall be A4 (21 X 29.7 cm). 4 - DEADLINE Works shall be submitted within 24:00 of 20th May 2018 at the address canevaridecontest@gmail.com, as a .jpg, .tiff or .pdf file with the resolution of 300 dpi, and report all personal data (first name, surname, complete address, phone number, in case of minors the name of one parent authorizing the participation). Every single file shall not exceed 5 MB. If more than one single work is submitted, then send each by single mail. The Jury reserves the right to report further works, which will not receive cash prizes. During the exhibitions of the works, there will be the possibility for visitors to indicate their favorite work. The authors, participating in the competition, give the non-exclusive right to publish the works on any support for promotional purposes of the Pro Loco Castle without having anything to claim as copyright. 7 - EXHIBITION Opening of the exhibition and prize giving will be held Saturday 3 July 2018 a Villa Frova, Caneva.